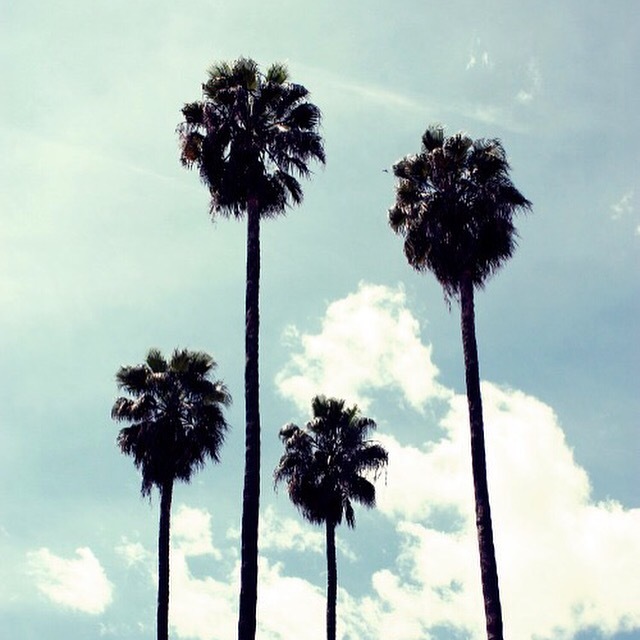 Well holiday day has finally arrived, yay! As you’ll know if you’ve been reading my recent posts, I’ve been planning for this trip for quite a while now between trying to be healthy and losing some weight, to planning each outfit meticulously in order to be party ready.I’ve never been to Ibiza before and have heard so many great things about the old town where we are staying, not to mention some of the incredible sunsets I’ve seen pictures of on Instagram. I’m pretty sure every evening we’ll be found in one sunset bar or another sipping cocktails while watching the sun go down. 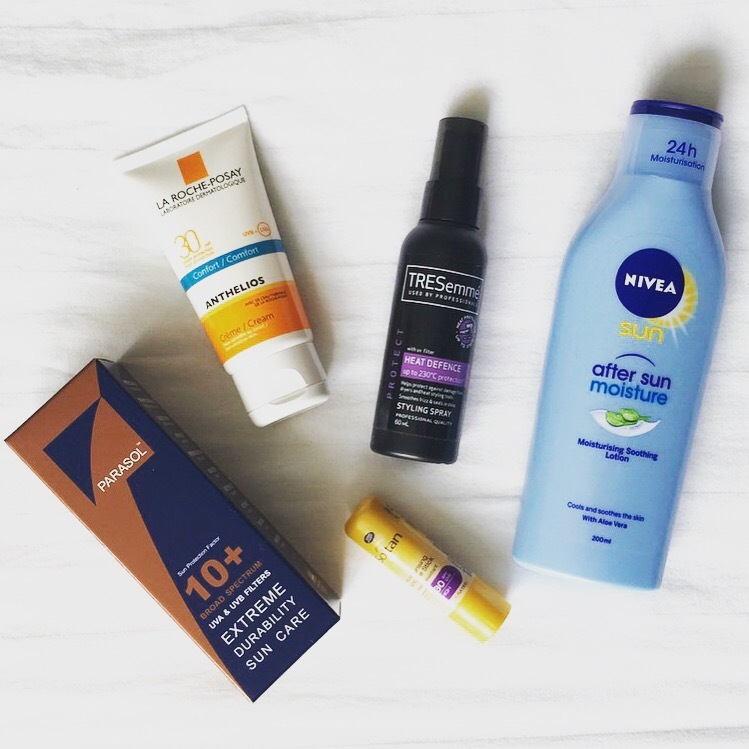 PARASOL SPF Sun Lotion – Obviously the most important thing when going away to somewhere hot is having good UV protection. I use Parasol Sun Care and have done for several years now. It’s an Irish brand so apart from supporting Irish, it’s the best sun lotion I’ve used. What’s more, you only need to apply it once a day, what more could you want?! For my face I usually use a brand called Heliocare as it’s the best I’ve come across for face protection. However, I’ve read a lot of good things about this La Roche-Posay Anthelios face cream so for this trip I decided to try it out. I’m using SPF 30 so I’ll keep you posted on what it’s like. Apart from face protection, I always buy separate lip protection too as I have very sensitive lips that tend to burn easily. The one I use a lot is this SPF 30 Lip Protection balm from the Boots Soltan range. It has great lasting power (even if you are sweating in the heat!) and doesn’t taste bad on your lips either like some other lip SPFs that I’ve tried. The Nivea Soothing Aftersun lotion is by far my favourite aftersun. It contains Aloe Vera, has a lovely creamy consistency and is super hydrating for the skin after a day lying in the sun. I have thick, curly hair and because of that, my hair is prone to getting very dry in the heat. I came across this Heat Defense spray from TRESemmé last summer. I was surprised to find that it kept my hair nourished and shiny so needless to say it’s going in my wash bag again this year. I’m a big fan of Elizabeth Arden’s Eight Hour Cream, I think it’s safe to say most beauty lovers are. I always have it in my handbag, and it’s great on holiday to relieve any insect bites or sunburn. 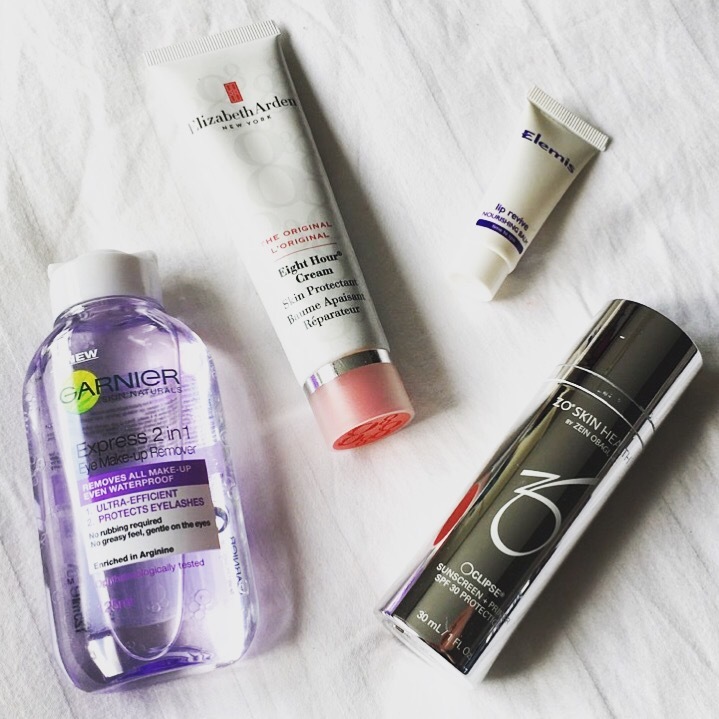 To remove my makeup at night, I’m bringing the new Garner Express 2 in 1 Make Up Remover. I haven’t tried it before but have read good reviews, plus it’s mini size so it’s perfect for travelling. I’ll keep you posted on what I think of it. As mentioned above, my lips can get very dry in the sun so I’m bringing my Elemis Lip Revive balm to keep my lips soft. I use Eight Hour Cream on my lips too, but as the Elemis balm is also mini size, it’s a handy one for the handbag in the evening! My Dr. Obagi Oclipse Sunscreen & Primer is what I wear on my face everyday. I am so particular about my skincare routine and use all Dr. Obagi products which I may have mentioned before. This primer is SPF 30 and is also tinted so great for holidays when you don’t want to wear makeup during the day. 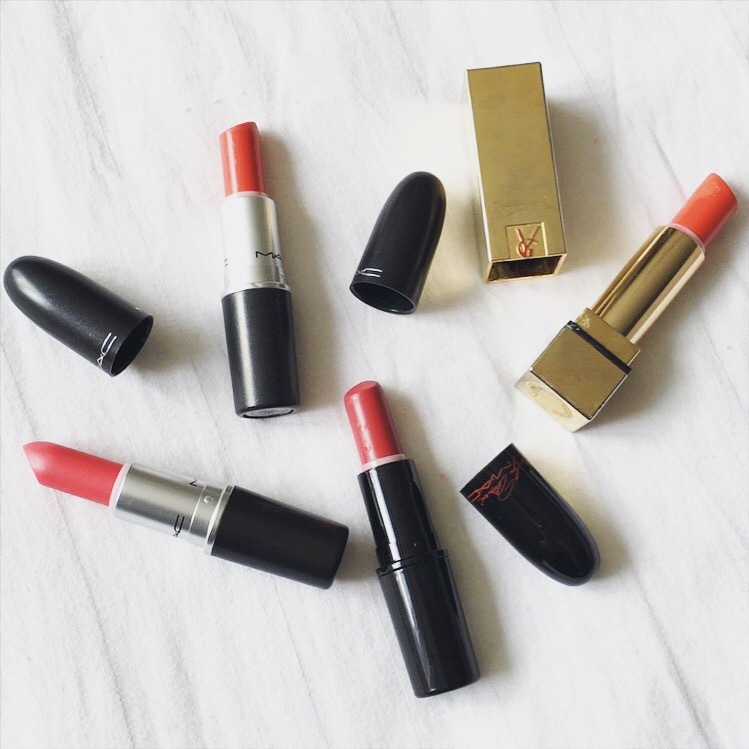 Lipstick, oh lipstick. My favourite! Many of you will already know that I’m obsessed with lipsticks, they are just my ‘thing’. In fact, on occasion I have been known to pick the lipstick colour before the outfit. Does anyone else do that?! Anyway, I’ve packed three of my favourite lipsticks, MAC Lady Danger, MAC Love Goddess (from the Marilyn Monroe collection), and YSL Le Orange. I also got a new lipstick for my trip called Relentlessly Red from MAC’s Retro Matte lipstick collection. This shade is literally my dream, I honestly don’t know how I haven’t come across it before now but I’m very excited to try it out. Can you tell I love orange and coral shades by the way?! 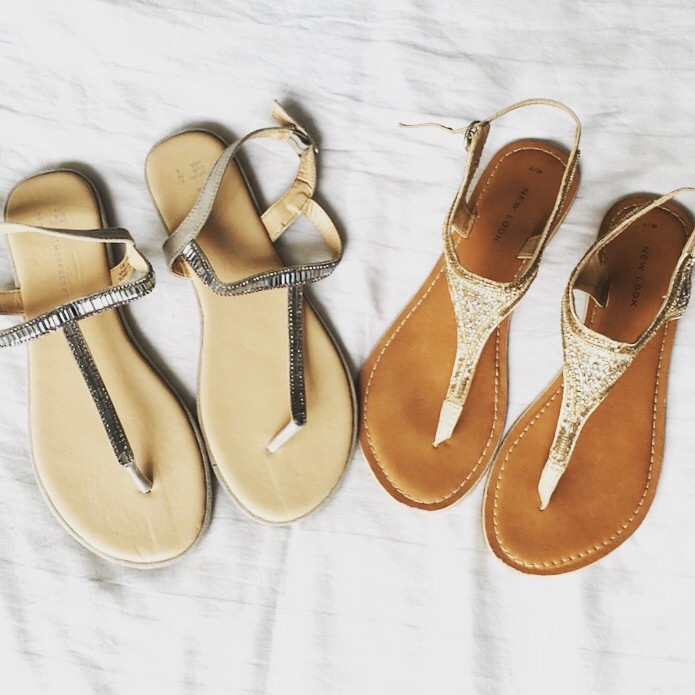 Every trip to the sun requires a pair or two of cute sandals but if I’m being honest I’ve actually packed five pairs, not just the two in this photo. I’m only going for five days so I know, it’s ridiculous. I know. But I just couldn’t resist, you’ll never know when you might need them, right?! These two pairs are from Penneys and New Look, and apart from being very inexpensive, they are very comfortable too. 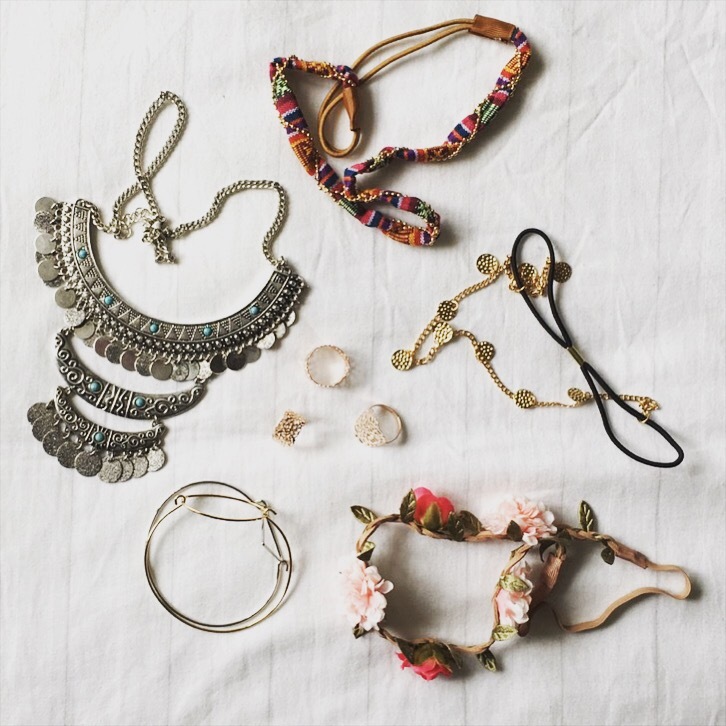 I’m an accessories girl at heart and as mentioned before, the theme for this trip away is Boho Chic. I’m a sucker for statement neck and head pieces, and there are so many great accessories on trend for this summer. I’m particularly loving H&M’s Coachella collection which is where the neck piece and floral head bands are from. DVF. Need I say more? 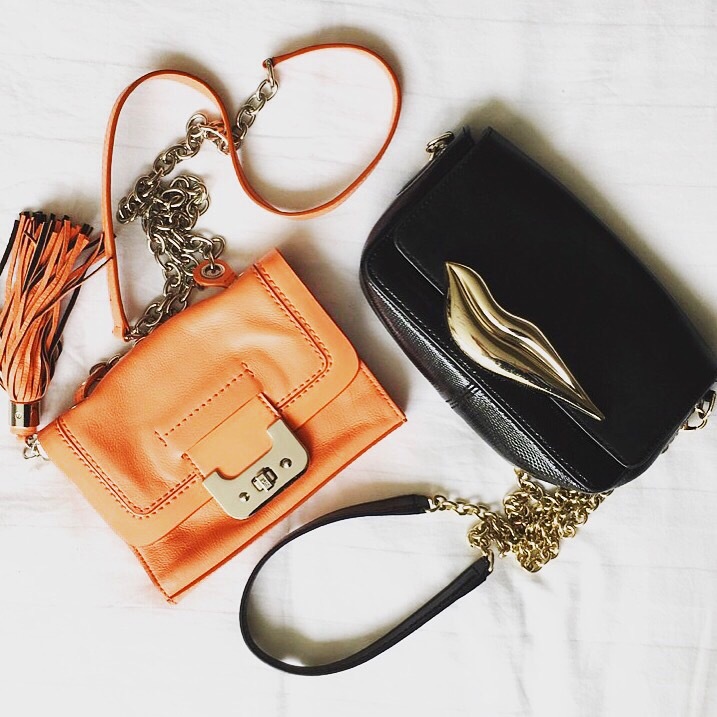 My DVF cross body mini bags are life! Big enough to fit all your essentials, small enough to throw across your body and go. My black one comes pretty much everywhere with me, and my bright coral one is a must for any trip to the sun. 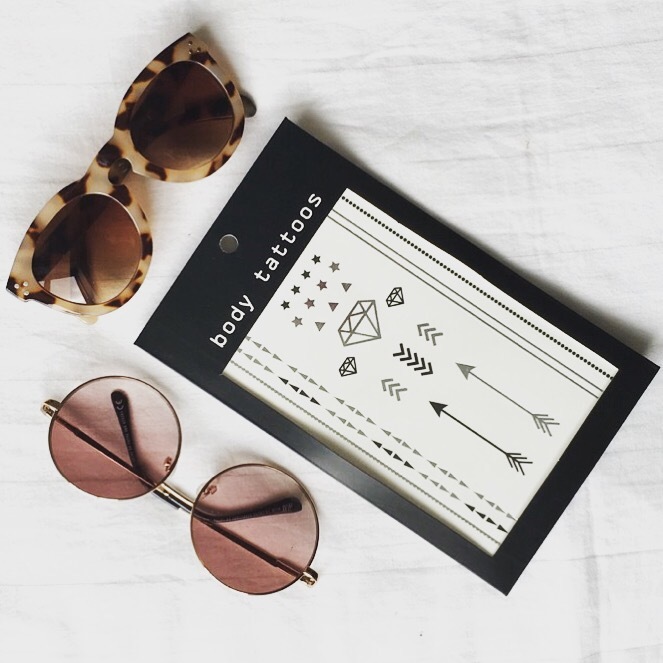 Lastly, I’m taking these amazing body tattoos which I picked up from the H&M Coachella collection also. The little stars are super cute and will be a great addition to my Boho theme. My sunglasses are from H&M and Penneys. Before you say it, I know, I’m bringing quite a lot of stuff for a five day trip. And that’s not even half of it. I’ve always had a tendency to overpack and I’m sure this time is no different, eeek! But what the hell, better to be safe than sorry. If you want to keep up to date on all my posts then click here to follow. Pretty please, I'm nice!